Every business owner knows they need it . . .
More People Who are Ready to Buy. Your business constantly needs new leads that can become customers, clients, and patients. It’s the lifeblood of every successful small business, and today, this connection happens mostly online. 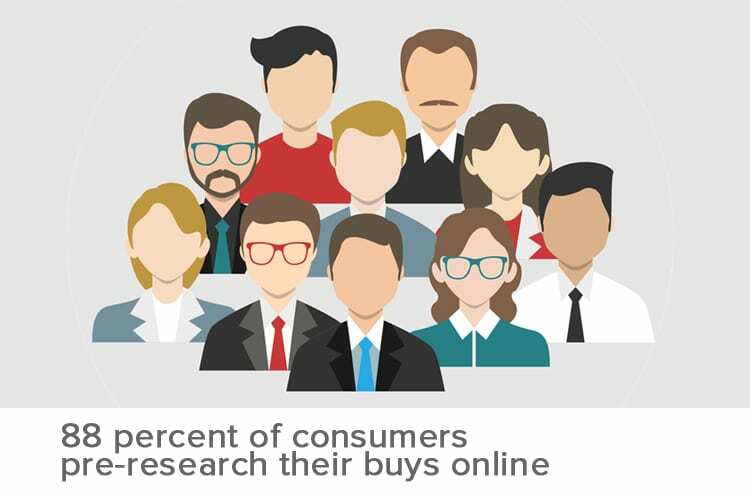 Recent studies indicate that 88 percent of consumers go online to research when looking for products and services, even higher for local purchases. People perform a search with a need that matches a solution, service or product your business offers. You need these people to be able to find, like, and trust you online. If you aren’t ranking for the right keywords, and you aren’t showing up in Google, then you don’t really exist online. You might even know the main keywords your business needs to rank for, but the challenge is that people are different, and quirky, and don’t always search your main keyword in the way you guess they would. 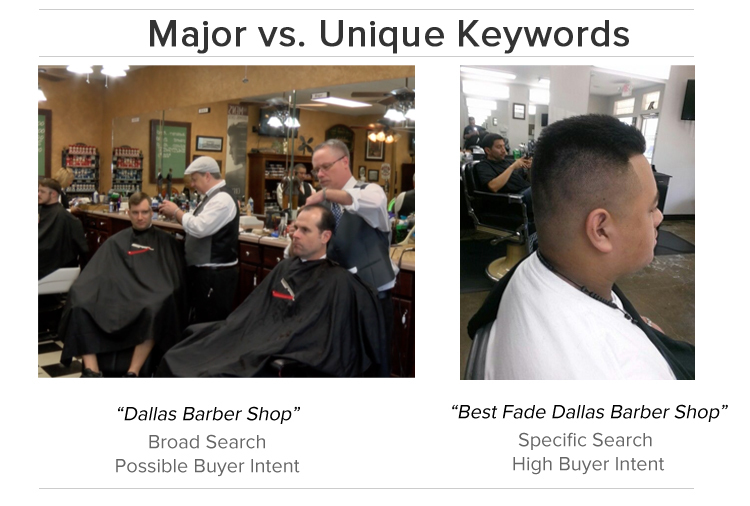 Instead of searching barber shop Dallas, they might search best fade barber shop Dallas, or even kid’s fade cuts near me. What it comes down to is that you have to rank for 1000’s of different combinations of these key terms (aka longtail keywords) if you really want to grow your business. In fact, Moz reports over 70% of internet searches use the longer, more unique formats. What if you could actually target each of these 1000’s of diverse search terms people use, rank on them in Google and other search engines, and have these searchers click your result and arrive at your site? That would be the gold standard of online marketing! You can do this with our Bubble-Up SEO Solution. The Bubble Up SEO System operates by placing a Search Learning Machine inside of your website. This Search Learning Machine (SLM) hums along in the background of your site and effortlessly finds the best keywords that people use when they are searching for a need that your business can solve. When enough searches happen on any given phrase, the Search Learning Machine takes note and then does something simply amazing. It automatically creates a new page to rank on that specific search phrase. Whenever the system sees a new keyword bubbling up, a page gets created, providing your business an opportunity to capitalize on that keyword. Traditional SEO agencies try to rank you for one to five important keywords. This is like having one giant hook in the water and hoping that fish bite, while your competitors are using the exact, same hook. With Bubble Up SEO, whenever a fish indicates he’s hungry, a new hook is created and dropped into the water. This happens again and again until you have 1000’s of hooks in the water where you already know there are hungry fish. Your site is now a massive trot line rather than a single rod and reel. While we CAN help your rank those massively competitive main keywords with organic SEO efforts, in the meantime you can also be getting tons of traffic and leads rapidly from these 1000 ’s of keyword combinations. We have many clients who never add more SEO efforts because of the volume of leads they receive from their Bubble Up SEO program. We walk hand-in-hand with and advise you throughout the life of your campaign. and over 800+ other keywords in the #1 position on Google. Site traffic rises dramatically with the Bubble Up Method tool installed. 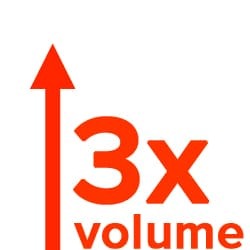 And, most importantly, her practice volume grew 3x in Q1 of 2018. And here is what their business development officer says…. The short answer is NO! It requires ZERO of your time to keep the Bubble Up SEO SLM humming along and your site looking great. A lot of folks have worked with search marketing firms before, and they ask for content, review content, review content, provide additional keywords, etc. This requires NONE of that. You don’t have to worry about the approving the content or managing each automatic page created. The Bubble Up’s SLM is smart because all your users are redirected to your site’s homepage or corresponding service page on your site when they click on the search result. The Bubble Up page grabs the ranking, but the end user sees your beautiful homepage or service page when they click, not the Bubble Up page. We can even take this next level! If we see a high volume of traffic coming from a particular keyword, we can even work with you to create a unique landing page addressing that issue and the redirect that particular search result to that tailored landing page. You’ll start ranking for keywords that people use when they are intent on making a purchase of your product or services. This allows you to be discovered, liked and trusted by potential customers, making conversion much easier. Once we install the Bubble Up System’s Smart Learning Machine, all you have to do is answer the phones and respond to leads. It’s that easy. 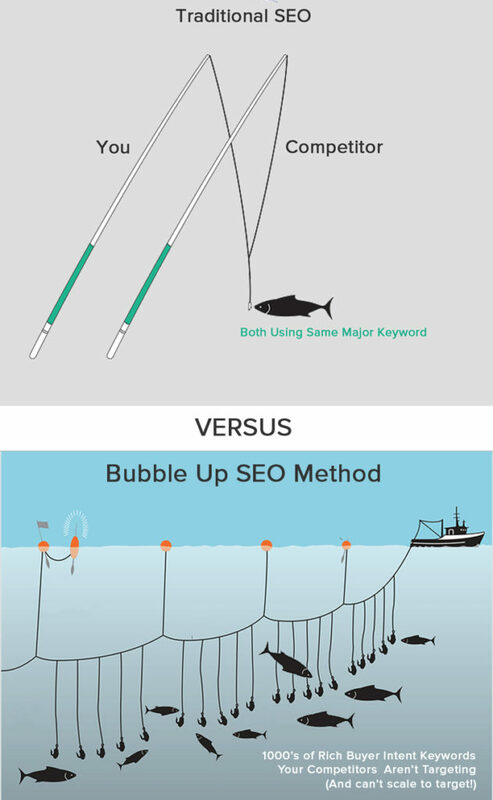 What is the Technology Behind Bubble-Up SEO? 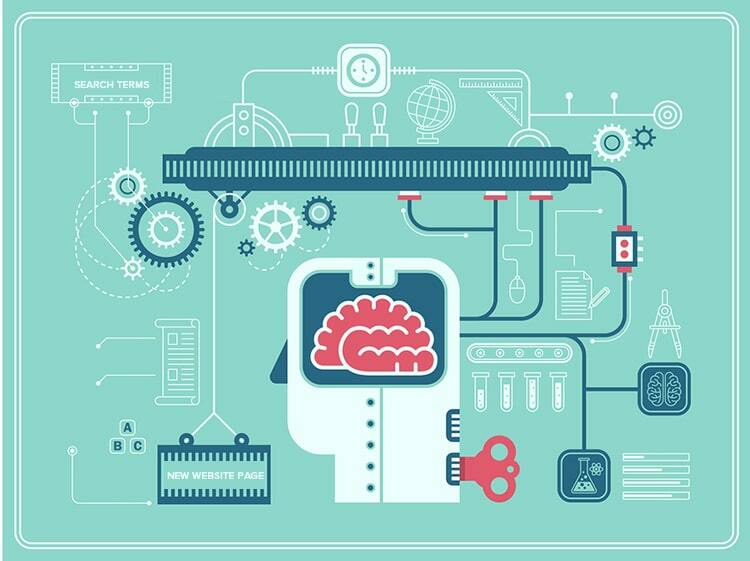 On the technical side, we’ve built a massively powerful and consistently tweaked Search Learning Machine software file which collects live keyword search volume and analyzes it. Our team of basement-dwelling techies’ abilities shine on this first of its kind development (and that’s their preference to stay in their well-furnished basement). This SLM enables your site to find real keyword phrases people are using and builds a page for that specific keyword search phrase. And here is a nice side benefit, each new page created helps your site rank higher across-the-board for other terms, as well. One hook helps the other hooks! Once we install Search Learning Machine, you don’t have to lift a finger to manage the pages. Our team constantly optimizes SLM to best match Google’s algorithms and it starts creating the dynamic pages, including content generation, page rendering, backlinking, monitoring, and reporting. It’s truly a headache less way to conquer the market using long-tail keywords. Here’s all we need from you to get started…a 15-minute planning call where we gather 5 pieces of data from you. Once this is done, we can have your Bubble Up SEO campaign up and running within 7 business days. You’ll get a monthly ranking report showing you all the keywords that have bubbled up and where you rank on them. You’ll also be able to clearly see an increase in web traffic and leads for your business. We believe in the results of the Bubble Up SEO system so much that we don’t require a long-term contract. Try out the system and see if you don’t agree that it’s a virtual goldmine for your business. We are wanting to roll out this new SEO Method to business owners who are serious about growing their business. The phone-call-only for launch lets us get to know you, understand your unique needs, and ensures you are focused on growth. P.S. What’s the value of one customer is to your business over the course of their lifetime? We’ve typically found even a single lead per month would more than pay for this solution. And we also know you’ll get WAY more than one lead per month using it! P.S.S. This is a great strategy to use in tandem with traditional SEO efforts to rank on your main highly competitive keywords. This dual strategy provides your business with a top-down and bottom-up approach to search engine rankings, increased site traffic, and LEADS.